For years, every time we so much as touch a toe out of state, I’ve put cemeteries on our travel itinerary. From garden-like cemeteries to boot hills, whether they’re the final resting places of the well-known but not that important or the important but not that well-known, I love them all. After realizing that there are a lot of taphophiles (cemetery and/or tombstone enthusiasts) out there, I’m finally putting my photo library of interesting tombstones to good use. It was August 16, 1920; the Cleveland Indians were playing the New York Yankees at the Polo Grounds in Manhattan. It was the top of the fifth, with Cleveland leading 3-0. Ray “Chappie” Chapman stepped up to the plate, crowding it as was apparently his usual tactic. Yankees pitcher Carl Mays let loose a high and tight fastball, and a split second later, there was a loud crack. The ball rolled back out toward Mays, who fielded it to first for an out. But Chappie hadn’t hit the ball at all. The sound that most people in the stadium thought was the ball connecting with the bat was actually the ball connecting with Chapman’s completely unprotected temple—this was long before helmets were used in baseball. Chapman immediately slumped to the ground, but a few minutes later, he tried to walk to the clubhouse with the help of his teammates. He only made it a few steps before he had to be carried off the field. He was taken to St. Lawrence Hospital, where doctors took X-rays and realized that Chapman was probably fatally injured. The impact caused a 3-inch-long fracture on his skull, and his brain had been jostled so badly against the bone that it had lacerations on both sides. Despite the hospital’s best efforts, Chappie passed away before morning. To this day, Chapman remains the only player to die from an injury received during a game. 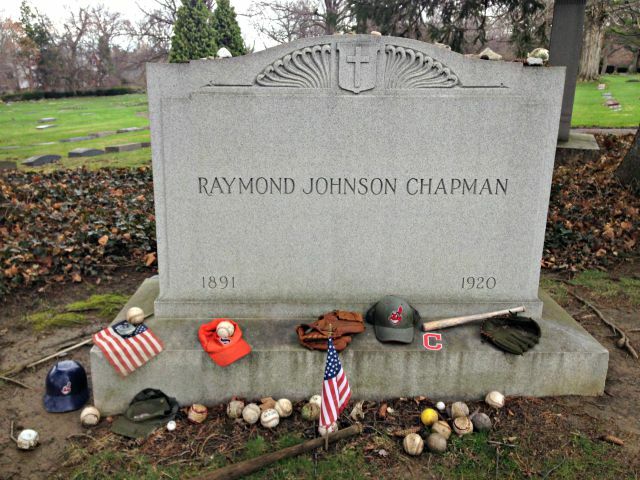 Though Major League Baseball didn’t make an official helmet rule until 1970, other changes to the game were enacted after Chapman’s death. For example, scuffed baseballs had to be replaced more often during games—many argued that the ball was so dirty, Chapman didn’t even see it coming at his face. Additionally, spitballs were banned starting with the 1921 season. 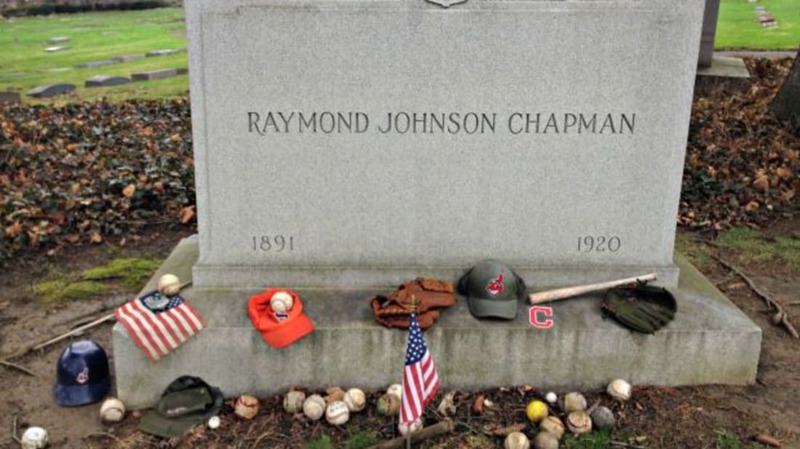 It’s been just shy of 100 years, but Clevelanders haven’t forgotten Ray Chapman. 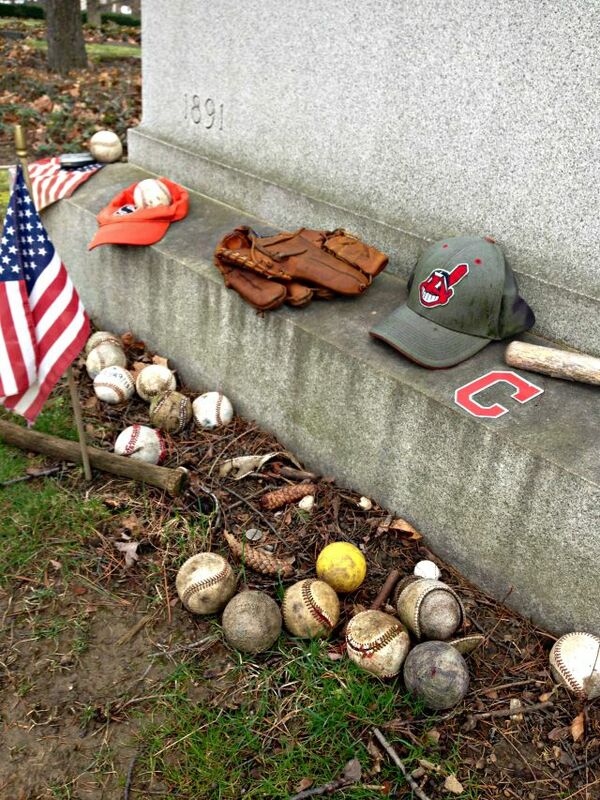 All season long, visitors stop by Lake View Cemetery to leave Chappie tokens, including baseballs, gloves, and even the one thing that would have saved his life: a helmet. 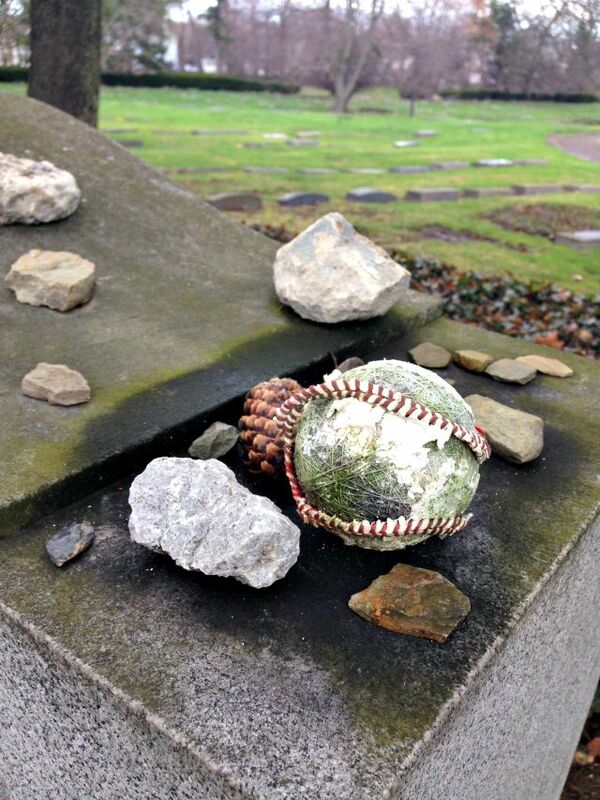 Peruse all entries in our Grave Sightings series here.